Back in the day, the Road to the Kentucky Derby was different. Horses ran in races that offered a big purse and the 20 horses with the most earnings garnered a spot in the field. Today, things have changed. There are prep races and each have points assigned to them. There are 17-point races, 85-point races and 170-point races. In the 17 pointers, the top four score on a 10-4-2-1 scale, meaning 10 points for first, four points for second, two points for third and one point for fourth. The 85 pointers offer 50-20-10-5, while the 170 pointers offer 100-40-20-10. Most horses run at least three prep races in their attempt to get to Louisville on that first Saturday in May. That usually means one 17-point race, followed by an 85-point race and, then, a 170-point race. The 170-point races are the major preps and include the Wood Memorial (G2), Bluegrass Stakes (G2), Santa Anita Derby (G1), Arkansas Derby (G1), Louisiana Derby (G2), Florida Derby (G1) and the UAE Derby (G2) in Dubai. New York is the Big Apple, the City That Never Sleeps. Frank Sinatra once sang that “If you can make it there, you can make it anywhere.” But for horses looking for Triple Crown glory, New York has turned into what some might label a quagmire. There are four Derby prep races in New York — all of which are contested at the Big A, Aqueduct Racetrack. The prep lid-lifter is the Jerome, usually held right on or near New Year’s Day. The Jerome is a 17-point race and, because it takes place in early January, it doesn’t always draw the best of the just-turned-3-year-old crop. Next up is the Withers (G3), usually run on the first Saturday in February, which, like the Jerome, offers 17 Derby points. The Gotham (G3), with 85 points, is next up in March, followed by New York’s major prep for the Derby — the Wood Memorial. There was a time when New York played a key role in determining who would win the American Classic races — the Derby, the Preakness (G1) and the Belmont (G1) and, yes, the Travers (G1) too. In the 1970s, New York was a major stop on the Triple Crown trail. In 1973, Angle Light pulled off a mild upset in winning the Wood Memorial. Ridden by Jacinto Vasquez and trained by Lucien Laurin, he beat a pretty good horse in Sham, who finished second. The third-place finisher was some horse called Secretariat. Vino Rossi outduels Enticed to win the Wood Memorial (photo by Viola Jaska/NYRA). In 1975, Foolish Pleasure took the Wood and then went on to win the Kentucky Derby, followed by runner-up finishes in both the Preakness and the Belmont. The Florida-bred won 16 of 26 starts, earned over $1.2 million and was in the money (third or better) in 23 of those 26 starts. However, Foolish Pleasure is probably best known for his ill-fated match race with the great Ruffian on July 6, 1975. Bold Forbes took the Wood in 1976 and then went on the win the Derby and Belmont; and, in 1977, Seattle Slew used the Wood as his springboard to Triple Crown glory. In 1981, Pleasant Colony won the Wood, then the Derby and Preakness, but, after that, came a long stretch of mediocrity. The next horse to win the Wood and then grab one of the classics was Fusaichi Pegasus. In 2000, the Japanese-owned colt won the Jerome, the Wood and the Kentucky Derby. No Wood winner has gone on to win the Derby since. In 2003, Empire Maker won the Aqueducy feature, but it was the horse he beat that became the darling of the nation. Funny Cide, aka “The Gutsy Gelding” became the first gelding to win the Derby since Clyde Van Dusen in 1929. 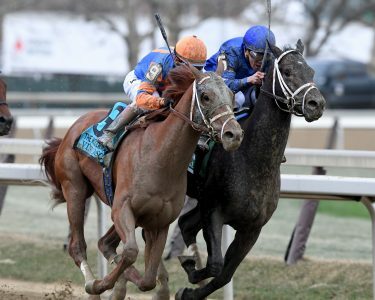 He then romped in the Preakness, but a rested Empire Maker was waiting for him at Belmont Park and was able to thwart Funny Cide’s run at Triple Crown glory over a rainy and sloppy track. As for the Jerome, the last great horse to win it was the aforementioned Fusaichi Pegasus in 2000. The Withers produced Bernadini in 2006 and, like Foolish Pleasure, he may be best remembered for winning the Preakness in a race where Derby winner and favorite Barbaro fractured his leg — an injury that ultimately led to him being euthanized in the summer of 2007. The Gotham, despite being closer to the Derby, has an even weaker history when it comes to winning classics. The last Gotham winner to win a classic was Easy Goer, who won the Belmont and Travers in 1989, but is probably better known for a string of second-place finishes to Sunday Silence — in the Derby, Preakness and Breeders’ Cup Classic (G1). In recent times, the winners of the classics have come from other places — Santa Anita, Oaklawn Park and Gulfstream Park. And because they haven’t come from Aqueduct and New York, the Wood Memorial is now a Grade 2 race. New York will never suffer from an identity crisis. It’s New York, perhaps the greatest city in the world (ask any New Yorker and they will tell you so). But in horse racing, New York has taken a back seat to the other tracks when it comes to the Triple Crown series. It’s been 16 years since Empire Maker won the Belmont and 19 years since Fusaichi Pegasus captured the Run for the Roses at Churchill Downs. Is 2019 the dawn of a new era? Only time will tell. Is There a Mine That Bird in the 2017 Kentucky Derby Field?